It's hard to find words that do this Single Malt justice. 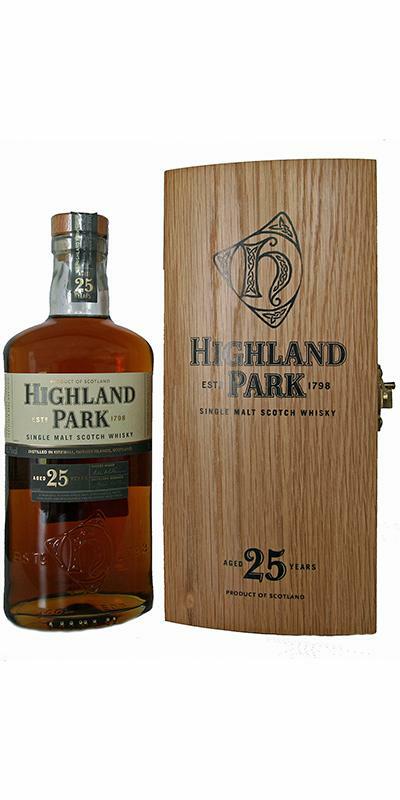 For many connoisseurs, Highland Park 25 is the Holy Grail of the distillery's official bottlings, and rightly so. I could literally spend hours with my nose in the Glencairn. Dark fruits, white chocolate and juicy oranges take turns with spices, cocoa beans and rummy notes. An explosion of sweet, dry and peppery flavors bewitches the palate while being perfectly balanced and complex at the same time. Faintest hints of smoke remain of a prolonged, sweet and spicy finish. This Orcadian experience is liquid gold! Where do I line up for the life time supply? 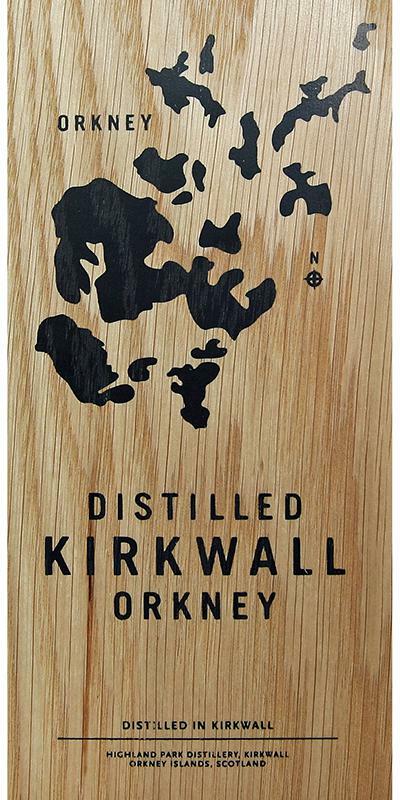 This is ridiculous good whisky. Thanks to Feorag86 for the sample. First nosing; quality, well matured and complex quality. So many fruits I can hardly separate them. Very sweet apples, peach and pear along with oranges to name a few. There's flowers too, I'm just not good with their names. Then chocolate, toffee, nougat, rum raisin, honey. It's all just floating about in waves waiting to be discovered. Spicy, almost prickly pepper on the arrival, quickly turning to a sweeter and rounder allspice. Going a little dryer on cocoa powder, coffee, leather. Hard to identify the lighter fruit notes from the nose under all the spice and bold darkness, but it's present underneath. I will not call the finish disappointing, because it's hard to follow such a nose and pallate. But I would have prefered it a little sweeter and less dry. No complaints about lenght, and there is a nice touch of fruit under a transperent blanket of light smoke at the very end. 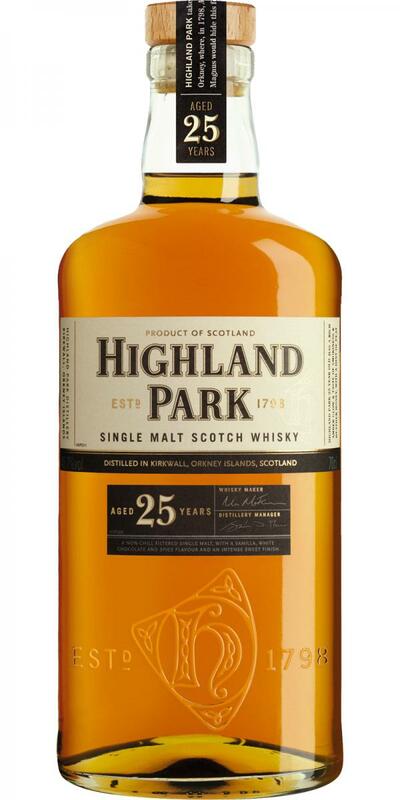 Although it states "new bottle design" for 2012 it was in fact a new bottle design for the 2007 release https://www.whiskybase.com/whiskies/whisky/34416/highland-park-25-year-old that was bottled at 48.1% abv. The 2012 release was the first of many different batches at 45.7% abv. And that first release in 2012 at 45.7% abv doesn't mean that all HP 25yo of 45.7% abv are bottled in 2012. Unfortunately HP doesn't do anything to indicated the different batches that have come out over the last six years. The HP 25yo I believe was released annually from 2012-2018 and I would estimate that the 30yo HPs of the same abv 45.7% had 3-5 different batches over the years starting in 2012 -2018, as well I've personally seen difference in colour between two bottles of the same 45.7% abv. Although it's well known that almost every year there was new bottles hitting the market at higher prices points in accordance with each new batch release. There is no discernible markings or stamp dating to indicate batch differences like with the Glendronach core range releases. One really needs to have two different batches to compare the colour difference, if you see a HP 25yo and its more gold colour with very little hint of amber that's the one that I had and rated an 87 https://www.whiskybase.com/whiskies/whisky/79566 , the darker one is a shade or two darker and you would definitely notice it being amber in colour to a certain degree. Although an 87 is not a bad mark but it is when there are many different batches sitting on store shelves at $750cnd and one does not know exactly what quality of batch one is getting. 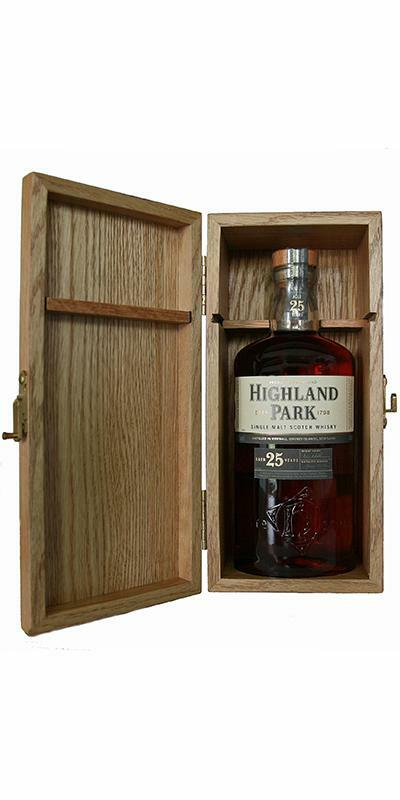 Immediately after pouring, the 25-year-old Highland Park is already showing its full-bodied, intense and elegant side. A multifaceted conglomeration of many different flavors flows to me hesitantly. With the Nosing one can well and gladly spend an hour. Wavy changes the nose and gradually unfolds its full potential. Lots of dates, many juicy oranges, a few dried orange peel, caramel sweets, dark chocolate, cocoa for baking and intense honey notes form the first aromatic base. The sherynoten win in the course of nosing significantly in intensity. Over ripe apples, hints of red fruits, raisins, walnuts, roasted almonds and many different spices (eg nutmeg and ginger) mix with spicy oak notes. The background is always a delicate smoky note. The alcohol (45.7%) is perfectly integrated. 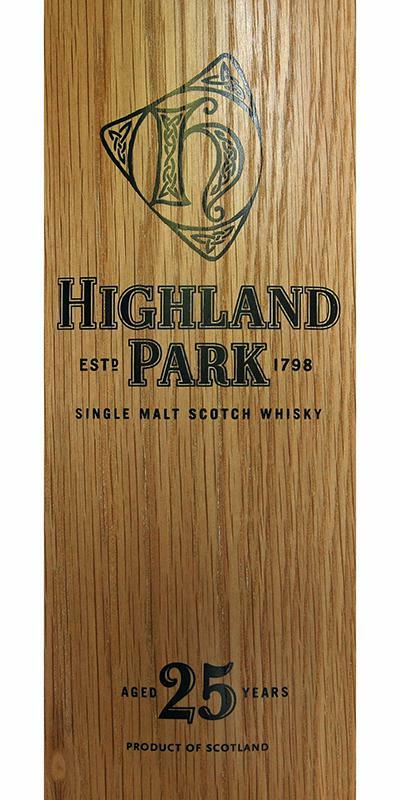 The texture of the Highland Park is silky soft, almost syrupy, the malt wets the entire oral cavity. A few peppercorns prance on the tip of the tongue for a short time before the dark, spicy-sweet aromas fully unfold. Juicy oranges, hints of red fruit, raisins, dates, honey, caramel, sweet pipe tobacco, dark dark chocolate and a touch of espresso mingle with many different spices and stately oak notes. The fine smoky note blends in wonderfully with the harmonious overall picture. The taste is very harmonious and balanced, always intense, elegant and multi-faceted. Long, sweet and spicy and warm. Black cherries, baked apples, juicy oranges, dates, raisins and plenty of dark dark chocolate are present. A short time later, nutmeg, cinnamon, a touch of leather, sweet pipe tobacco and spicy, old Eichholznoten follow. The fine smoky note lingers pleasantly in the background again and ensures the final fine-tuning. A subtle dryness remains on the palate. It has a lot to offer ... but do not give it a whiff, but serve it bit by bit, bit by bit, so that you can take your time with the aroma research. A gentleman. Very fruity at the beginning: fresh apples, apricots, peaches. Orangenmus. Over it a hint of lavender, rose water, a touch of violet perfume. Behind them are toffee sweets, caramel and honey. It becomes chocolaty, first whole milk, then rather towards nougat / noisette. Over time, the fresh fruit, the malt is darker, earthier, it comes in raisins inlaid raisins, dried and sulfurized apricot pieces (but no sulfur notes). Very slight smoky note, which could be confused with a herbal note. Full and creamy, slightly dry, the lavender and the violet perfume from the nose, but here at the beginning of much chocolate and freshly sliced ​​raisin bread. Leather notes. Oak pushes in, but does not reach the foreground. Very mild smoke. Mild herbs, spices (cinnamon, coriander, allspice). Over time, it gets even drier, but keeps the balance very nice. Medium long, dry, orange peel, dark chocolate. sparkling start, like the bite into a juicy orange with a little shell, dark chocolate, the barrel is there at the same time as the orange, the chocolate turns into spicy espresso. Very spicy, cinnamon + cloves + nutmeg, raisins, quince marmalade, honey, slightly burnt caramel, ripe aromatic apples, again a touch of honeydew melon. Strawberries, raspberries, every sip tingles and warms, white pepper spreads; Over and over again, the juicy sweet orange and the pleasantly hot espresso, leather. 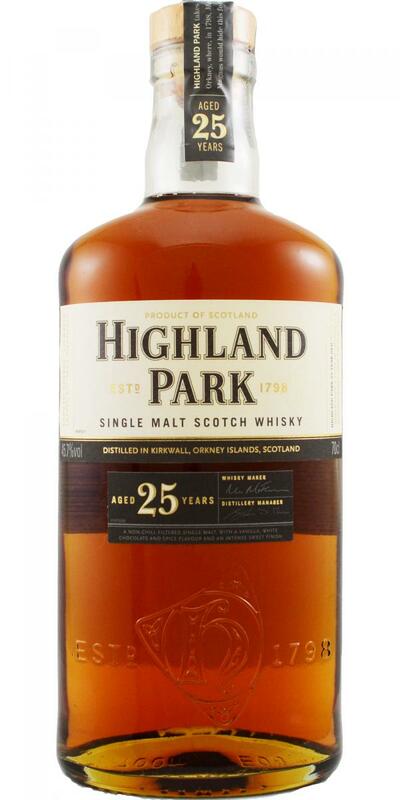 A great, noble, mature Highland Park - wonderful multi-layered - a top whisky!